With the 2018 fantasy season now officially in the books, attention necessarily turns to 2019. Whether for determining which players owners should keep or simply aiding next year’s drafts, I’ll be evaluating players this offseason who had surprisingly strong or poor numbers this year. Were they one-offs who are poised to be drastically overrated or underrated next spring, or was 2018 predictive, indicating a trend that owners need to be out in front of? Today, a player coming off a fantastic sophomore season, yet one who didn’t sustain the impressive batted ball improvements which had me believing he was on the brink of stardom a few months ago. That batted ball drop-off, coupled with early indications that owners are fully on-board for next year, has me a bit apprehensive of Mitch Haniger in 2019. Can’t wait until the spring to get the 2019 fantasy baseball season started? Well, you don’t have to. Leagues are already open for 2019, so get your league started today. Despite an impressive rookie season- in which he slashed .282/.352/.491 with 16 home runs- Haniger was not a must-have for fantasy owners entering the year. Per ESPN’s average draft position rankings, Haniger was coming off the board at pick 227 on aggregate. While there was some disconnect there, it’s not hard to understand why owners weren’t diving all the way in. Never an elite prospect, Haniger was a late bloomer entering his age-27 season. It’s not that no one was optimistic, but Mitch Haniger was not one of the consensus can’t-miss young players populating the game today. Even those optimistic about Haniger probably didn’t forecast what he managed last year. His rate stats were almost identical to what he managed in 2017, and he was on the field nearly as much as anyone in baseball. Not only did he sustain his strong rookie performance, but he also one-upped it, increasing his walks while keeping all his other numbers identical over a larger sample. The whole performance was enough to place him in the top 50 on the season-ending Player Rater. 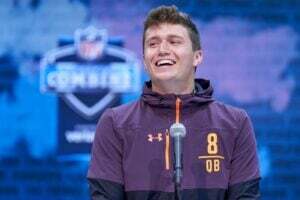 Owners have basically come around now, with early mocks placing him 53rd off the board for 2019. But should we be all-in on Mitch Haniger as a borderline star? I’m not so sure. Haniger was one of the very best hitters in MLB in April, and a change to his batted ball profile seemed to have a lot to do with that. His fly ball rate at the time was way up relative to last season, and it looked like Haniger had changed his swing to sacrifice contact for impact. In retrospect, that didn’t prove sustainable, either because Haniger never had made such a drastic adjustment or because pitchers worked him differently in response to his newfound game power. 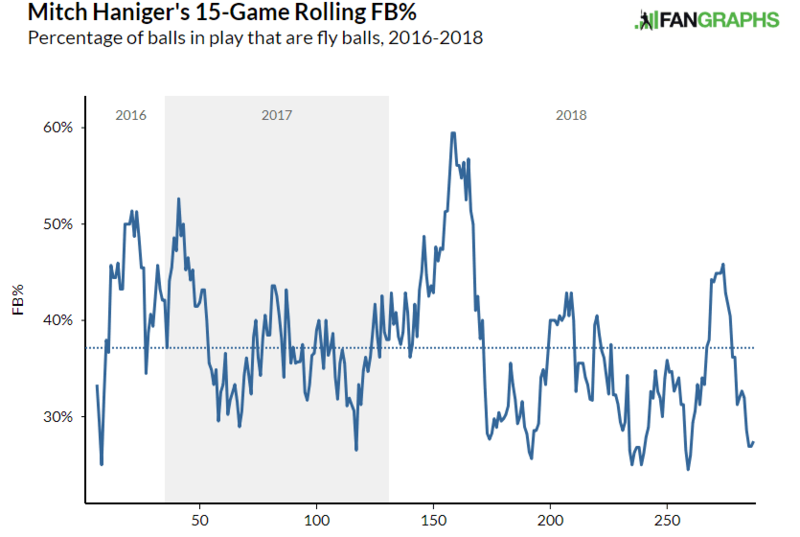 You see the spike in Haniger’s fly ball rate at the beginning of 2018, but by the beginning of May, his batted ball data essentially reverted to prior levels. 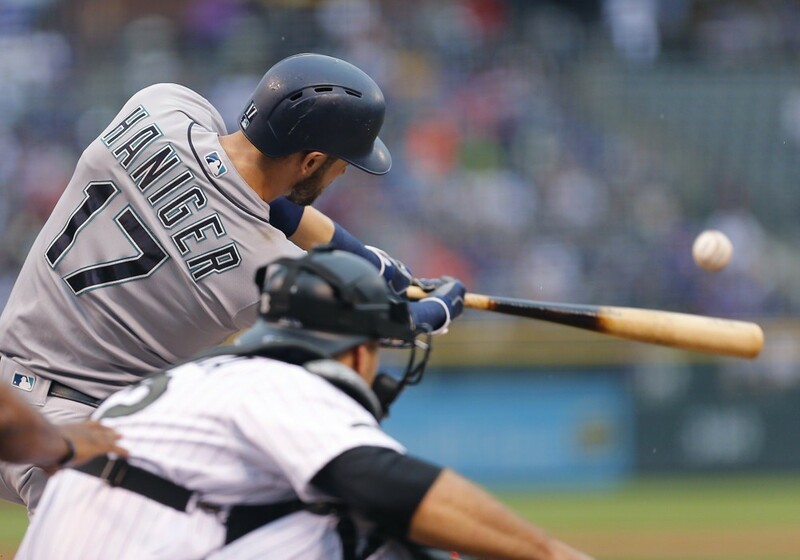 Any dreams of Mitch Haniger as a true slugger proved to be short-lived. 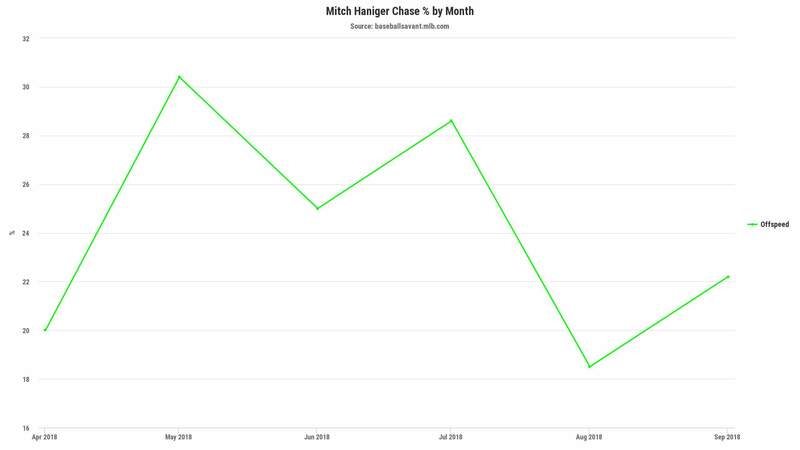 This didn’t constitute Haniger’s demise, though; far from it, as he continued to post well above-average numbers from May onward. It seems that Haniger just brought back a contact-oriented approach. There doesn’t appear to be a huge change in Haniger’s mechanics as the year progressed. Rather, the difference seems to be one of approach, and it has me a bit apprehensive about him moving forward. In April, Haniger was especially adept at laying off offspeed pitches out of the strike zone. That’s crucial since Haniger can’t really hit those pitches. Per Statcast, among 201 hitters with at least 50 plate appearances ending with offspeed pitches (changeups and splitters) since his 2016 debut, Haniger ranks only 141st in weighted on-base average against them. By contrast, he ranks 45th out of 474 players against fastballs in that same span. Hitting changeups just isn’t a strong suit of his. Haniger’s clearly at his best when pitchers have to challenge him with velocity. It doesn’t seem coincidental that his best three months (April, August, and September) were the ones in which he stayed off out-of-zone offspeed pitches the most. It’s fair to point out that this seeming flaw hasn’t yet held Haniger back, of course, and that Haniger ended the season on another high note. It’s not as if his season fell apart after April. He was a different hitter- a less impactful one- but he remained quite good after the year’s first month. Even if he’s not the slugger he was in April, he’s valuable, and we can’t just discount April entirely. He did have one of the better months by any player all season, so there’s unquestionable ceiling here. All true. I can’t buy into Mitch Haniger as a slugger, though, since he wasn’t able to keep the ball in the air for more than a few weeks. He also strikes out about as often as the average player. To hit .280, then, he needs to maintain a strong batting average on balls in play. Yet he’s also not a player who sprays the ball across the diamond. Indeed, he’s pulled over 60% of his career ground balls, which should make him susceptible to shifts. The shift hasn’t seemingly yet affected him, but it’s another factor to keep in the back of your mind. All of this said, Mitch Haniger is, no doubt, a good player- a guy who should hit at least .260 with 18-20 home runs and play every day. Nothing in his batted ball data this year indicate that he didn’t deserve the results he garnered this year, and he’s overperformed expectations before. It’s entirely defensible to point to Haniger’s impressive results and say that I’m overthinking things. Yet I have a hard time overlooking his rather glaring struggles against offspeed pitches and the drop-off in his fly balls long-term. The 2018 season feels as though it might have been a career season, with pitchers now having a full offseason to gameplan against the drawbacks in Haniger’s profile. 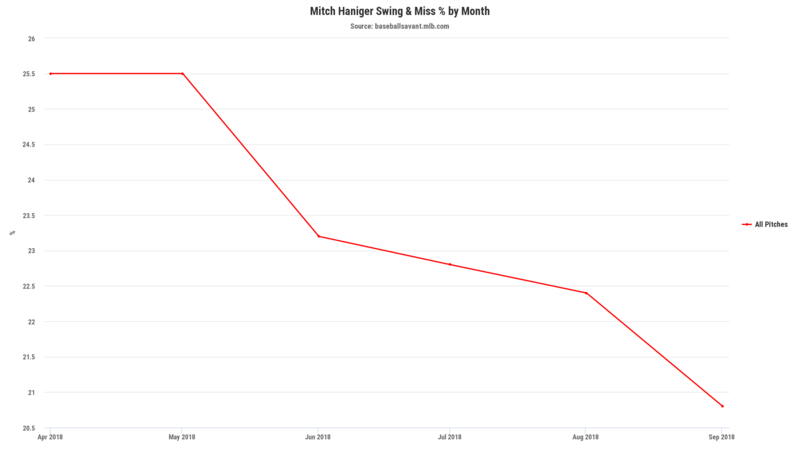 I’d be happy to be proven wrong, but if his current ADP reflects how he’s viewed entering next season, I won’t have many Mitch Haniger shares for 2019. Keep up with all the latest Fantasy Baseball happenings with Van Lee, Jeff Zimmerman, and Rob Silver on the Launch Angle Podcast.